So I tried my hand at a little embroidery this winter and whipped up a little sumthin' sumthin' for my mum. It turned out... fine. (considering it was my first attempt, it wasn't hideous and that's acceptable). I've thought a few times since then that I should try my hand (for reals) at learning to wield a needle somewhat competently. 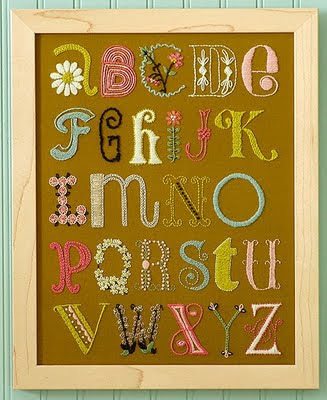 Today, I saw this uber-cute ABC embroidery sampler. Why, yes. It is going on my summer list of projects-to-do. While sipping lemonade. And watching the kids play in the yard. And trying not to extract blood from every fingertip.